If you are up for a fun challenge, iFit treadmill workouts are worth your while to check out. Owners of NordicTrack, ProForm, Reebok and Freemotion treadmills can stream a variety of workouts from the internet including fat blasting sessions with Jillian Michaels and train anywhere world-wide with Google map integration. The iFit technology works exclusively with machines made by ICON Fitness. iFit treadmill workouts are integrated with the treadmill’s console or your tablet or phone; first, as an audio tool where an instructor coaches you through the workout and offers motivation, and second as the technology takes command of the machine changing the speed, resistance, and incline during the session, much like a pre-set program loaded onto the treadmill. The iFit technology is ever-changing, and it is getting much easier to use than in the past. The latest version is called iFit Coach, and the treadmills are either iFit enabled or iFit compatible. 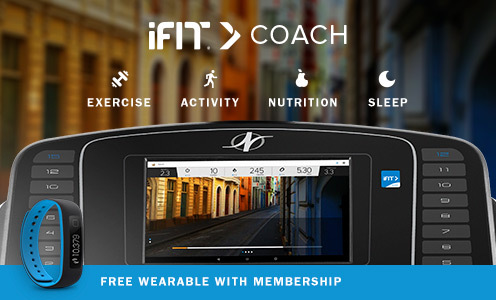 iFit enabled means that you do not have to purchase a separate console to access the workouts. They either integrate with the console or you can access them via Bluetooth on your smart phone or tablet. For iFit enabled machines, you need to purchase a subscription/membership to use it, roughly $12 per month and well worth it. iFit compatible means you have to purchase a separate module to be able to use iFit technology, but fewer and fewer machines require a separate module these days. For iFit compatible machines, the separate module comes with a one year free subscription. In general, the more expensive NordicTracks, ProForms and other ICON machines will come iFit enabled, whereas the less expensive models may be iFit compatible. The latest version of the iFit technology is more all-inclusive, adding nutrition to the mix with suggested meal plans based on your fitness goals. iFit Coach also provides endless personalized workouts and activity tracking, and of course, Google maps so you can literally work out anywhere in the world. The price is currently $15-$39 a month, depending on your plan, and you get a free iFit wearable with your membership as of this writing, but that might change over time. You can track everything from your steps to your meals to your sleep, and there are a host of tools to use to set goals for yourself, share the information with family and friends and fully keep on top of your training to maximize your results. The iFit program syncs with your machine, and depending on which treadmill you purchase you can view the info and maps on the display itself, or by using your smart phone or tablet. 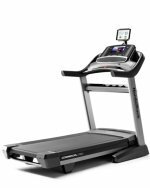 If you are interested in the latest iFit technology, your best bet is one of the newer NordicTrack treadmills or one of the ProForm machines, as ICON Fitness puts most of their focus on these two brands. You'll find the latest versions of iFit on these machines, and almost all of them are iFit ready. How does iFit compare to other programs? iFit is definitely the most advanced of all of the interactive programming out there. The Google map feature alone makes it much more appealing, but with the personalized workouts, nutrition plan, and automatic change of speed and incline on some models, it's really in a class by itself. There are some nice programs out there, however, and if you prefer another brand don't let iFit sway you. For example, Horizon Fitness offers ViaFit tracking and Passport videos on some of their higher end models. Yowza has myLiveLight which uses your weight to recommend workout programs and track your results. Life Fitness offers console options with internet and app syncing. Sole Fitness now has Bluetooth syncing to the Sole app and other popular apps. Precor has Preva workout tracking. But none of the other programs to date have as many features as iFit Coach offers, as ICON has spent a lot more tim developing the technology and there's a lot more features and capabilities. So currently, iFit is the best immersive fitness program offered, but that may change in the future. This includes a variety of workouts, plans for a lifestyle makeover, and much more. 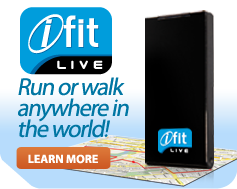 All you do is connect the iFit Live module into your treadmill’s console, and then to the internet via your computer using your home’s wireless network. You will have access to the iFit diet program, which includes the ability to record your daily meals. Once you enter in your meal description, you will automatically see the calorie count and nutritional value. Since the choice of foods affects your training, you’ll get tips on how to make the best choices for snacks and meals to meet your goals and work towards optimum wellness. The online iFit treadmill workouts also allow you to run trails all over the world via Google Maps. This unique program gives you the virtual feel of running anywhere in the world – from the streets of Paris to being in the middle of the pack of the Boston Marathon – right in your own home. Google Maps provides terrain data that adjusts your treadmill incline and decline to mimic the topography of the trail or city street you’ve selected. The online system is also there for you to provide support, store stats for your fitness progress, and give you two-way access to your social network on Facebook, as well as get trainer tips for encouragement and specialized goals. Another cool feature of these iFit treadmill workouts is doing fat shredding workouts with Jillian Michaels, the celebrity trainer of TV’s The Biggest Loser. You can download a customized fitness plan from Jillian and her trainers every single day. The incline and speed are controlled for you while you concentrate on breathing, posture, and form. You’ll be alerted when a transition is coming up. But best of all, you’ll hear Jillian’s voice coaching you and motivating you through each step. These are some amazing treadmill workouts to help you reach your goals. If you’ve been reluctant to get started with exercising, or you’ve been at it awhile but have lost your motivation, the iFit treadmill workouts will get you excited about doing your daily cardio. As the world’s first fully integrated fitness program, you no longer have to worry about working out alone – there’s a team of professionals right at your fingertips taking you through every step.